A while back, I was listening to an episode of Cog-Dog Radio in which Sarah was talking about hiking and meeting uncontrolled dogs on trail and she said a thing that just perfectly linked a hundred different thoughts that had been bouncing around in my head. And it was like the weight of the world was lifted off my shoulders. Or to be more precise: the weight of walking my own dogs — one well-trained and also intensely reactive at baseline; the other at the time quite social but young and impressionable and recovering from injury and long, rocky rehab — in the world. Specifically, of walking them in a world in which my only frame of reference for “a good hike” was “one in which everyone had a good time” and also in which my only tools for making that happen were training skills that relied on maintaining distance and thus on expecting other people to be able to control their dogs and thus getting increasingly angry and guilty and scared every time it turned out that we don’t actually live in that world. I had seen the symptoms that Sarah talks about in her (really excellent) podcasts: the growing hypervigilence and anxiety in my dogs and myself both. I had started to fumble through trying to find solutions. I’ll forever be grateful to the woman with the Lab that I met on the Welch-Dickey loop one morning, early in my two-dog days and in a moment of utter chaos, who quietly gave us a wide berth while chatting with her dog: “Wasn’t that fun? Wasn’t that fun!” And I mean, it wasn’t. But it gave me a model for doing something — anything! — other than just training my own dogs and righteously holding the trail and feeling like a failure when that didn’t work. And suddenly I felt so much better, because suddenly I saw into another world where my frame of reference for “a good hike” could still be “one in which everyone had a good time” but there was room for resetting my own expectations, for allowing the fact that we exist in the world, and for coming up with strategies for everyone (that I’m personally responsible for) to have a great time without depending on other folks having a level of control over their dogs that most of them are just never going to have. I started this post thinking that I would maybe end it by listing out and describing some of those strategies. But as I type, I think maybe not. I don’t want to just replace one set of impossible goals with another. I don’t want to even risk making anybody feel one bit the way that I used to (and still do, sometimes, but now I can recognize, breathe through it, and get happy again on the other side) — that there is some magic combination of words and behaviors that will guarantee an undisturbed walk. I just want to say that there’s not, and that’s okay, and that I — and you! — and everybody! — can have good hikes, even so. It turns out that the world is a pretty okay place to live. Now wasn’t that fun? I posted on Facebook recently that “Apparently ‘teach people to do their own hiking route-planning’ is the windmill against which I have chosen to tilt this summer.” I was halfway kidding, but only halfway. I follow a couple of local hiking groups in which people are constantly asking, “Which mountain should I hike tomorrow? What route should I use to hike it?” and it makes me a little crazy because for me, part of what makes hiking fun and keeps it engaging over time is being able to pick and plan my own routes. I understand why that can be an intimidating thing if you’ve never done it before! But it’s not actually a hard skill to learn. So I’ve put together this little five-step guide for anyone who wants to try it out. Stop worrying and learn to love random choice. It really doesn’t! Or rather, it doesn’t matter much. There are some very basic criteria that are always smart to keep in mind, especially if hiking is a new activity for you. Try not too bite off more than you happily chew, distance and difficulty-wise. Don’t go above treeline in poor visibility or during an electrical storm. Stay off the difficult scrambles if they’re icy or wet or likely to become so later in the day. Best practice is always to cross-reference your plan for the day with the White Mountain Guide so you’ll know what to expect and then seek out additional resources as needed to clarify, “How’s that water crossing?” or, “Will I be sad if I try descending this trail in the rain?” I’m not going to cover those resources here. For purposes of this post, just know that they exist. But outside of those parameters, it genuinely does not matter much which mountains you hike or what order you hike them in. So just pick something. Whatever is closest to you or farthest away. Whatever your finger lands on when you point randomly at your map. Whatever name appeals to you most or whatever strikes your fancy. Zealand intrigued me long before I ever hiked it. I have no idea why, but to this day that mountain and the area around it feel more like home than anything else in the Whites. It doesn’t matter. It’s going to be fine. Pick anything. Read a little about it. If you don’t like what you read, pick something else. And if you just need somebody to tell you that what you picked is a fine choice, then shoot me a message on Instagram and tell me all about it. I’m not an expert in every trail and I’m not very swift in responding to comments here, but IG is easy from my phone and I’m happy to play sounding board and reassure you that, “Yes, Pierce from Mt. Clinton Rd is a lovely first choice,” or, “Maybe Osseo would better than Flume Slide if you’re worried about your dog.” Seriously. Standing offer. You can even start route-planning by not route-planning. One of the nice things about hiking the Whites is that the popular trails to the popular mountains are really well-documented. I recommend the Steve Smith book and also this website. Once you have your mountain picked out, both will help you figure out how to get there. There’s nothing in the world wrong with hiking the easiest and most popular routes, especially if you’re new or building confidence. Again, cross-reference with the WMG. Then go ahead and follow all that good advice that’s available to you. Enjoy! The other option here is to have or make hiking friends who are willing to take charge of the planning department and follow them around. Ask them how the picked the route that they did and what options they’d considered but discarded and why. They’re doing you a service, so maybe offer to feed them now and again. In retrospect, I owe some folks some food. 3. Same destination, different journey. Grab your maps. Grab your Guide. Where does that trail come from? Where do you need to start to get back to that junction on the way to the top of your mountain? What is down in that valley and what would you need to do to see it for yourself? Figure it out and then give it a try. Congratulation! You’ve planned your first route. One of my favorite hikes last year was an out-and-back to Spaulding Lake. That hike was motivated entirely by hiking along the shoulder of Mt. Washington looking down into the Great Gulf and feeling curious about the little blue spot that I could see way down below me. Likewise: on my list for this year is Carrigain via Desolation trail because of the time that I stood in the fire tower thinking, “Wow, I really hated the Signal Ridge approach but that side looks beautiful!” I don’t know yet what I’ll think of that side, but I’m excited to find out. Lots of people only ever hike 4,000 footers and if that’s you, that’s fine. But there is plenty else to see in the Whites — some of it on the way to higher summits and some of it worthy for its own sake. After you’ve sparked your curiosity in real-time by picking out new things to try while on trail, the next step can be sitting at home on a rainy day (like today) and getting curious about the maps that came with your WMG. In some ways this is just step #1 again, but with more confidence. What looks interesting? What names and fine prints catch your eye? Which do you remember from friend’s photos or from other people’s posts in your local groups? See those little stars that indicate scenic views? What happens if you string a few of those together until you have as much or as little mileage and challenge (look at the topo lines and your WMG) as you want for the day? This can be a great way to give back to those hiking buddies that shepherded you along in step 2 or to new buddies who want to join your adventures. I recently took a relatively novice hiker up Madison for the first time; I knew from previous hikes that they were fit, game, and capable and I had been eyeing some scenic view stars, so we ascended via Howker Ridge instead of Valley Way; time will tell if that planted any seeds. 5. Hike all the trails. Yep. After a few years of describing my weird, gorgeous hikes to nowhere as joyrides, I have reached acceptance. I’m officially redlining now. That means I’m trying to hike all the trails in the White Mountain Guide. I’m only a bit over 22% done as of now, so this is my hobby for the next couple of years. Step #5 is not actually “start redlining,” unless of course you want to. Step #5 is just, “Start hiking more trails for the sake of hiking more trails.” If you love Franconia Ridge, try to approach it from every possible route and direction. If you love the Wild River Wilderness, load up your backpack and hike it the whole way around. What does Isolation look like if you hit Crawford and Stairs on your way in? Beats me, but I hope to find out in the next month or three. Sometimes hiking a new trail just for the sake of hiking a new trail is less rewarding than you might hope. But often it’s more. It turns out that the prettiest part of the wildly popular Alpine Garden is the two-tenths of a mile that almost no one hikes. And now that every trail is in play for me, I’m starting to look at the maps in a new way, not just for the trip that I’m planning today but also for how other future trips fit alongside it. It’s like seeing into a new dimension. It’s the most exciting thing to happen to my hiking since my first 4,000-footer. Which was Waumbek, by the way, in a pouring early June rain. So if you’ve read all this and you still want to know which mountain you should hike first, next, or last? The answer is Waumbek. Just make sure you peek a little farther down Kilkenny Ridge and save a picture in your mind for the future before turning for home. I think about leashes a lot. I own a few other leashes that hang out in the gear closet in case I need one in a pinch. And I have one old leash that lives in the Jeep for the inevitable stray-dog pickup. Those five, though, are the leashes that I actually use. And I use them a lot. Because I’m in kind of a funny position as dog-hikers go. I have one dog who is so solid off-leash that I sometimes forget to even bring one along for her, just in case. And then I have one dog who has the best raw material for off-leash hiking of any dog I’ve owned but whose recall is not yet up to my standards; he doesn’t want to leave me and his recall is damn near 100% off of people, but will not reliably recall off of dogs at this point in his life and so end of story — game over — he’s attached to me or else dragging a line except in very specific circumstances while we continue to Work On That. I also had a previous dog who simply did not get to be loose in the woods. Ever. He was too prey-driven and too fast and I didn’t at the time have the skills to train enough safety into him, so once all of the above became clear, he did many happy miles always on-leash. That is: I don’t make my decisions about whether and when to use a leash based on ideas of one choice being objectively better than the other. I make them based on the dog(s) in front of me, on the situation, on my feelings about and goals for the day. Which means that I think about leashes every time I leave the house: which one(s) and how many to bring? I think about them on trail, sometimes dozens of time: when to add, when to remove, when to drop or pick up, collect or pay out? I think about them every time that I take a picture for our Instagram feed, because it’s true a leash can be an attractive visual asset, but it can also be awkwardly placed or garishly colored or just kind of ruin an otherwise lovely photo. I don’t, for the record, edit leashes out of photos. And I only very rarely remove a leash specifically for a photo. Maybe once every third or fourth hike. I’m pretty lazy, for one. But more than that, I think it’s important to show my hand and my leash. I think it’s important to show that lots of different kinds of dogs hike, in lots of different stages of their training and lots of different environments and with lots of different handler comfort levels. 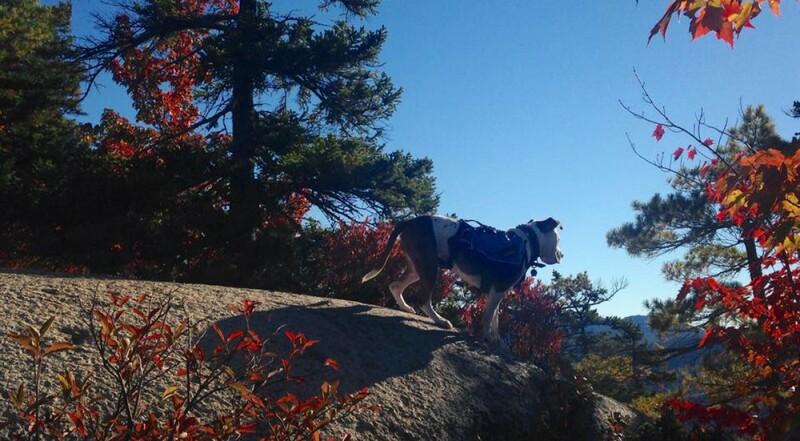 I think that off-leash hiking has tremendous value for dogs — see Cog-Dog Radio on decompression walks for tons more info about that — and I also think there’s tremendous value in demonstrating that it’s not the only way. Because here’s the thing: people have lots of feelings about leashes. People make lots of assumptions about what a leash or its absence might mean and attach a whole lot of judgment, sometimes, to same. (And maybe this is the place to mention that when I talk about choosing whether to use a leash, I’m talking specifically about places where leashes are optional. I live in a state with lots of those places. I get that this is not the case everywhere, but please don’t at me about breaking leash laws; that’s not what we’re talking about here.) People attach lots of magical thinking to what a leash can or can’t do. But a leash is just a leash. It’s a way of attaching your dog to your body. It can do some stuff: increase safety, limit self-reinforcement, allow communication, increase handler comfort. It can’t do everything: dogs on leashes can still get into trouble, get hurt, blow off cues, muck up the alpine zone, make other handlers and dogs uncomfortable, and frankly I’ve had my and my dogs’ space invaded by more leashed dogs followed by oblivious handlers than by anything else. I wish, often, that we could all talk less about the leash — this 1,000 words and counting aside! — and more about what we’re hoping to achieve by using one or by not, more about how we communicate with our dogs and ourselves and each other, more about the joy of having one dog so in-tune and well-reinforced that they can often be trusted with absolute freedom of movement, more about the reassuring light touch at the other end of the line that means the other — equally joyous — can be kept back from the cliff-edge or stranger’s sandwich if need be. Here’s the secret: that leash in the photo only bothers me. The dog doesn’t care. The dog is just happy to be out in the world, sniffing for squirrels and rolling in snow and checking back in for a cookie again. That leash in the photo isn’t a leash. It’s a gateway. It’s freedom, every bit as much as its absence can be. It’s only a leash. There’s only the right choice for this dog, this handler, this context, this point in time. See the whole system clearly. Decide. I’ve been writing this post in my head for a while. I really dislike messing around with images in WordPress, though, so I got annoyed and rage-quit every time I tried to write it for real. Something beats nothing, though. So here I am lowering criteria: words, yes, and images, no. When last we spoke, the dogs and I had returned triumphant from our first backpacking trip in a decade (me) and ever (them). A few plot twists arrived hard on the heels of that outing and I spent the rest of 2017 adjusting to a role change at work and a return to the unpartnered life. It’s all to the good, for sure! There just was not a lot of bandwidth left over for writing (or fighting with WordPress). But here we are now. February isn’t too late to review our hopes for the year that was and define some new. 1) Return to the New Hampshire 4,000 footers. Success! I said something grim in last year’s post about it counting even if I just hiked Tecumseh a bunch and I came close to living that nightmare: late last winter, Lilo and I did run up from the ski area just to get a 4ker done. I backed off this one for the summer. Titus’s bionic leg was holding up very well to flat miles and significantly less well to climbing, so we disappeared into wilderness areas and the Belknap range to gain some fitness. Something clicked for him in August, though, and his newfound strength carried us up Garfield, the first new 4ker for all three of us in Quite Some Time. Then we got him Jackson on Labor Day weekend and haven’t looked back since. 2) Sleep outdoors three times. Success! Two backpacks — Flat Mountain Pond and Spruce Brook tent site — and one New Hampshire car camping weekend, plus some nights in the tent (and the Jeep) while road-tripping. I have a lot of anxiety about food while backpacking for some reason and the kindness of friends in that department made these trips much easier for me, but we got out and did and that’s a win. 3) Work on the paw-protection puzzle. Qualified success. Lilo now has a set of fleece-lined Muttluks that that make it possible for her to go for walks in really frigid temperatures. They’re not perfect; she doesn’t love them yet and while they mostly stay on well, some days she throws the same boot over and over again. But they’re miles better than anything else we’ve tried and they do fill the niche we need them do. 4) Hike in Vermont, New York, and/or Maine. Success! We ended up doing a significant road trip for each of September, October, and November, and incorporated a whole bunch of tiny hikes in Vermont, New York, Pennsylvania, Ohio, Indiana, Illinois, Maryland, and West Virginia. And yes, we’ve even done a little in Maine. 5) Train each dog in public once per week. Ahaha, no. I mean. I guess we fulfilled the letter of the law in that we were out and about in the world every week and I rewarded behaviors that I liked in the process. The point of this exercise, though, was to increase our training-specific outings. I don’t know what our average was, but definitely less than once per week. I learned a few things about what makes it easy for me to Go Train Dogs and what stops me, though. Useful, but still a fail. 6) Invite the possibility of new hiking buddies on four separate occasions. Qualified success, I think. I put at least four invitations out into the world. I think only one actually resulted in hiking with any new people — that was a very pleasant local snowshoe on a very, very cold day — but the goal was to try. I tried. And I did reconnect with a few older hiking buddies who I hadn’t seen in a while, so that was nice. As for 2018, my concrete goals are fewer. I think they’ll keep us busy, though. 1) Finish Titus’s New Hampshire 48. He’s ready. That other knee is always a question. But he’s as well-rehabbed as I can make him and it’s going to be whatever it’s going to be. In the meantime, I think he’s ready. He’s sitting at eleven summits now with ten months left in the year. We’ll nip away at what feels good during the winter and then once the ice melts, we’re going for it. Wish us luck! And let me know if you’d like to tag along. 2) Pursue TEAM 1 titles with both dogs and get Titus into the rally ring. Here’s what I learned from the year of trying to regain my formal training momentum: I’m goal-oriented. I mean, I already knew that. But I enjoy process and journey enough, and have built into my life enough failsafes to keep my crazypants competitive side from making me nuts, that sometimes I forget. It’s still true. I need clear, concrete goals and clear, concrete achievements and clear, concrete accountabilities to get certain stuff done. I debated adding “get Lilo into an ORT” to this list. I ultimately opted to not. She’s super fun to handle in nosework and I want to do more with her, but I have enough anxiety about the idea of taking a dog to a trial without it being my reactive dog. I like the idea of the TEAM titles, though. Video titling has never appealed to me before, but this program is really interestingly-designed and I think is a nice goal for both dogs. And I have wanted to do some rally for ages and ages now. I think T would enjoy every piece of that process. And I really want to get him heeling. This year, we will. 3) Hike at least one 20-mile day and three Terrifying 25 trails. This might be a dog-free goal. So that’s weird! I’ve taken it pretty easy on trail for the last year and change. For dog reasons, for logistical reasons, sometimes because I felt like a flattish, beautiful trail was an offer that I couldn’t refuse, and sometimes because I just had enough else going on in my life that was hard and I needed hiking to be easy. No regrets: it was what I needed and most days I would still rather hike out into the wilderness than up a crowded mountain. That said. I love long days and difficult, scrambly trails every bit much as I love joyriding and waterfalls. And it feels like times to get back in touch with the me that did some of those (relatively, for us mere mortals) big traverses and went back the next day for more. Need to add fitness and subtract some ice, and then we’ll see where this takes me. And that’s all that I know. I’m not going to formally put another “sleep outside” goal on here; I’m confident that will happen anyway, including in service to Titus’s push for the 48. And I’m not going to set a formal blogging goal, either. But I’ll see what I can do. Just don’t hold your breath over the pictures. So this weekend was kind of a big deal! My family camped pretty regularly when I was small and I backpacked solo (plus dog) during my college years. I had wanted, for a while, to thru-hike the Appalachian trail. Instead I bought a horse, which pretty much consumed the next decade! But I’ve been thinking. Toying with the idea. Standing on mountains looking down into forest and pond and wanting, even while I appreciated the wide-open view, to know what was down below. But there were complications. Missing highly relevant pieces of gear now that I’m living in New Hampshire instead of Illinois. Titus’s injury and then Titus’s inability to sleep in the presence of humans. Weather. Fear. And then: this weekend. An invitation to join some friends at Flat Mountain Pond. A small, accepting, dog-loving crew with whom I felt safe enough to ask dumb questions, break out my 15-year-old gear, and believe would still like me even if a certain darling cattlefrog chose to bark all night. Flat Mountain Pond trail is an easy about-five-mile walk from the Bennett Street trailhead. We opted to shave a little distance and add a little climbing in exchange for scenic pools and cascades by taking the Bennett Street trail for the first part of the hike and hooking onto Flat Mountain Pond a bit later on. I opted to start a bit after the others in the name of getting enough sleep (and to hike off my jitters without inflicting them on anybody but the dogs!). And I was a bad hiker: I looked at the map and skimmed the book description for water crossing info and obvious red flags, but didn’t bother to check the elevation gain. So I was a little surprised by hitting a short but bracingly steep stretch of trail! But I’ve been wanting to get a little more climbing into the dogs. And myself! I was especially proud of us all at the numerous water crossings. I worry about water. It’s an easy place for something to go badly wrong. But we were calm and methodical. I focused on the task and my foot placement and never felt uncomfortable, even when navigating some awkward spots. Titus handled his temporary off-leash privileges without making me regret them and when I opted to keep him leashed crossing, never made me regret that, either. And Lilo, who I used to have to baby across, was cool as a cucumber. And when we reached the pond, our friends were there and we otherwise had the place to ourselves. That was exciting for everyone! Fog lifted and settled and lifted again for the entirety of the trip. Sometimes we had stunning views, as above. Sometimes the pond, peaks, pines were enshrouded and those stumps seemed to float in midair. There was no bad options and the constant gentle shift was fascinating to watch. My gear was a mishmash of new equipment (like the Ursack bear bag that I used, with odor-barrier plastic bags, to protect my food), dayhiking stuff that I’ve acquired along the way, and my Kelty external frame pack and Walrus tent that my parents gave me high school graduation presents back in 2000. The tent is a heavier than comparable modern tents, but pretty bombproof and — it turned out — more spacious than I had remembered. Two humans would be stretching it, but one human and two dogs worked just fine! And the pack felt like coming home. I wouldn’t want to carry it on technical terrain, but for this, it worked just fine. We do need to dial in our sleep system aside from the tent. The dogs were comfy, but I wanted more sleeping bag than I got! And I really need to solve the bugs-biting-my-short-haired-dog issue. The flies and mosquitoes were vicious this weekend. All four dogs felt it, but poor Lilo was the only non-cattle dog on site and thus the easiest target by far. I’ve been utterly unimpressed by the “natural” sprays that I’ve tried in the past and she hates them besides. A Vectra trial last year was uninspiring. And I’m reluctant to use my own sprays on a creature that licks herself. If the budget was endless, I’d put her in a Hurtta Sun & Bug Blocker and pick up doggy sleeping systems for them both. But alas, I have my limitations and I’m not sure the size chart accommodates her, to boot. So I’ll keep thinking. And I’m very open to suggestions if you folks have solutions that work for you! I was really impressed with both dogs. They hiked beautifully in both directions and were generally good citizens in camp and in the tent. Cosleeping in the bedroom at home is still an ongoing process, so I was especially leery about the latter — but they slept better than I did! I’m not totally sure I should celebrate that, but hey. As for me, I can’t remember the last time that I spent so long just sitting still, resting and relaxing, enjoying the company of friends and enjoying the company of myself. I’m doer and a goer, by nature and having Titus has both exacerbated and made me reevalaute those tendencies. I don’t rest very well when left to my own devices. But the weight-carrying hike in, the excellent and mellow company, and the perfect peace of the setting all worked its magic on me. For a day and a morning, I was able to let go and just be still. And then walk back out again! I left ahead of the others on account of the very warm forecast; I wanted as much of Lilo’s hiking as possible done before it got hot. We timed it right, I think. In the last mile I was sweating even hiking downhill, but never really uncomfortable. Titus, who is the least fit of us currently, finished up tired but game. And Lilo actually seemed to get stronger as she went along (although she’s holding down the couch pretty well right now!). Now we rest, recover, regroup. I’m not sure what or when our next outing will be. But there will be a next outing. For now, that’s enough for me. Photos by Paws on Peaks. First things first: we have an Instagram now! It is cleverly usernamed @bullyandblaze. I’m be posting one or two pictures a day, either current events or older favorites, and we’ll just see where it goes from there. Speaking of current events, I’m pleased to report that we’ve been hiking a lot lately! Our mileage is vanishingly tiny but our frequency is up from nearly zero to several times per week. Right now, frequency matters more. Contributing factors? Primarily two. Not these two, seen here atop tiny Bog Mountain. Factor the first: Titus’s last check-up with our local vet. The listened thoughtfully to my assessment of our current state, conducted a careful exam, and then made it clear in the process of discussing timelines and options that he thought Titus looked pretty good and that I should go ahead and do more with him. Sure is interesting how much better I feel about listening when a vet says that while making clear that I am heard, understood, and will be supported if things don’t go well than when they imply that I am crazy and/or stupid! Or committed to dabbling a few toes, at least. Look who wades in the water now! Factor two was realizing how many new-to-me trails there are within 20-40min of my house that are totally suitable for this current project. I’d been feeling a little down, friends, about not hiking big hikes currently. Or not even about the big hikes, necessarily. Just: new places. New trails. There were so many routes on my wishlist, but precious few fit our current parameters for distance and difficultly. Simultaneously enter a bit of creative Googling and also a new obedience class for Titus that has me driving just a slightly different direction than I had ever driven before. And thus enter a whole new list (and reminders of a few former favorites) of easy-to-moderate short hikes that don’t require spending more time in the car than we’ll spend on trail. South Mountain loop at Pawtuckaway. Not a new route, but one that I haven’t visited in a while and a perfect fit for date-night hiking! So we’ve reinstated the midweeknight hike that was a favorite feature of last summer. Not enough time between work and bed for long drives or long dramatic hikes, but plenty for a few pleasant miles away from it all. Like any adventure, they don’t all work out. We made it less than a mile into a very pretty hike last week, for example, before retreating in haste from what turned out to be a mosquito hellpit! But trying things again feels good, even so. And finally enter, once more, the reminder that there are worse fates than spending more time in the car driving through beautiful landscape than on trail hiking through same. The photo that I was arranging didn’t turn out as well as I’d hoped, but I love this one (taken by Paws on Peaks) even better! I think we’re about a month away from taking another look at any of my longstanding wishlist hikes and given the way the last year has gone, it may turn out to be much longer than that. But affirmed support and new excitement are a heady combination, and we’re all enjoying getting to walk through the flowers as well as stopping to take a few sniffs of same. We hit the road last weekend: central New Hampshire to Pittsburg, PA, and back. We drove from one green spot on the map to the next, checked out all sorts of pretty little forest roads and trails, and then on the return drive, stopped at the AT just past Bennington, VT. Many miles still lay ahead of us, but those rocks and white blazes felt an awful lot like home. Please pardon our dust bunnies. First we hike. Then we clean.